RetroAttack has put together a really great treasury. Filled with a wide variety of items including clothing, housewares, and a really cute purse (if I do say so myself) this treasury has beautiful items that all look great together. Please check out this treasury to go to all of the great shops it is showcasing. My favorite pick in the treasury is a beautiful tea dress by SohoMode. The dress featured in the treasury is a reserved listing but SohoMode has other really great items that should be explored. Her prices are great & her clothing is SUPER cute. Please also check out RetroAttack's shop. The curator of this treasury has fun buttons, pocket mirrors & magnets with fun, vintage graphics. Thank you Retro for including me in your beautiful treasury! A friend of mine brought this Etsy shop to my attention. 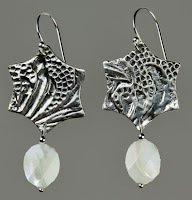 Rensday is a jewelry shop that stands above the very many jewelry shops one can find at Etsy. For the time being Rensday is a small shop but her items are all lovely. Made from PMC (precious metal clay) the items have a sense of already being loved for a long time. 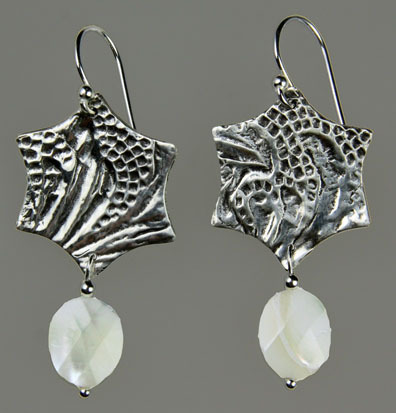 Pictured is my current favorite of Rensday items, a beautiful pair of earrings with dangling mother of pearls. Please go to Rensday's shop and see the other items available for purchase.